Pus (or purulent exudate in vet terms) is a mixture of white blood cells, serum, wound secretion, and often some whole blood. It arises because of the body’s immune response to the presence of undesirable matter, and is a natural effort by the body to be cleansed of this matter. If the foreign matter came from an outside source (for example, stepping on a nail), it is likely contaminated with bacteria that will flourish in the wound environment. However, the presence of bacteria is not at all necessary for the formation of pus and abscessing. A very common example of this would be the sterile abscesses that occasionally form at vaccine sites in dogs. Occasionally a few weeks after vaccinating a dog you will see a fluid-filled swelling at the injection site. If you aspirate this fluid and look under the microscope you will see classic “pus,” but if you culture it there will be no growth. The dog’s body found the vaccine to be an irritant, walled the area off and created an abscess as a means to remove the offensive particles. This is much the same thing as happens in the hooves of horses in barefoot lameness rehabilitation. As the blood supply to the corium is increased, some of the corium is just not healthy enough to be restored to full function. The body finds this sick or dead tissue offensive and again sends in the immune system products – especially macrophages and neutrophils, to “eat up” this tissue. Then these now toxic immune system cells are ejected from the body creating the drainage you see as an abscess. While shod, this area of corium was probably just barely alive. 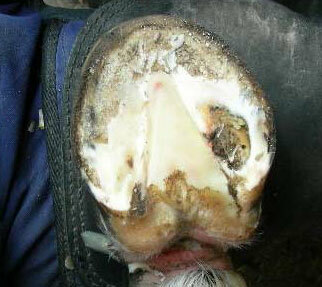 As shoes are removed and the animal is trimmed this tissue is stretched to accommodate hoof mechanism as well as the slowly expanding hoof size. Some of this sick corium is not up to the job and dies. While still shod the horse did not experience much pain associated with this problem because first, the tissue was not experiencing much demand and second, shoes cause horse’s feet to be numb. Shod horses feet are not totally without sensation, but their sensitivity is much reduced. The poor blood flow caused by the presence of the shoe creates an “asleep” sensation, much like we experience when our leg falls asleep after sitting in a cramped position for too long. As a veterinarian with over 20 years of clinical experience I have no problem at all accepting the presence of sterile abscesses, and in fact have seen literally hundreds of them in the course of my career.